The Place Located in Scotts Square in Orchard Road, Paradise Teochew Restaurant is a fairly new concept by the Paradise Group which debuted at Chinese Swimming Club in Amber Road. This is the second outlet of Paradise Teochew at a more accessible location to diners right smack in Orchard Road. The interior of the restaurant is classy oriental style with a main dining area, in addition to a few private rooms. The Food We started off with a classic Teochew dish, the Chilled Yellow Roe Crab in Teochew Style (S$9 per 100g). This is always one of the best ways for us to appreciate the freshness of the crabs and the sweetness of the golden roe. The Teochew Crabmeat Roll (S$22) is another delicious starter to whet our appetites. It’s never too late for dim sum, where we tried the extremely cute and instagram-worthy Steamed Custard Bun in Piggy Shape (S$5.80/3pieccs). We were sceptical of the taste initially as it looked like another food fad to us but surprisingly, the custard flavour and texture of the bun turned out to be right for me. Another traditional Teochew dim sum is the Steamed Glutinous Rice Roll in Teochew Style (S$4.80/3pieccs). This dish was a favourite amongst the table, and it went well especially with the chilli sauce. One of our favourites here is the Pan-fried Oyster Omelette in Teochew Style (S$16), a classic Teochew street food which many are unaware of. This dish reminded me of the version I had while in the Teochew province in China, a testament to the authenticity of the menu here at Paradise Teochew. 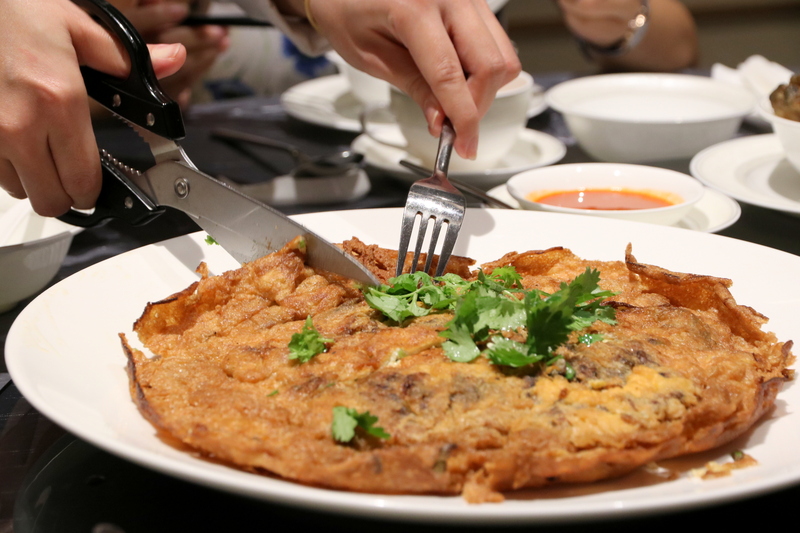 The huge omelette was fried to a crispy texture, exactly how we like it to be. We thought that roasted sucking pig is a Cantonese dish, but it seems like there is a Teochew way to handle this traditional classic meat as well. The Roasted Suckling Pig in Teochew Style (S$178 / S$208) is no doubt an extravagant dish to try if you have a good size party. There were no qualms that the skin was extremely crispy going by the distinct crackling sound as we took each bite. The pork meat was roasted to a nice tender texture too. One unique dish we tried was the Crispy, Sweet and Sour Noodles in Teochew Style (S$14 for small, S$21 for medium, S$28 for large). This tasted to us like crispy fried noodles pizza, which we were encouraged to have it plain and try it by adding some vinegar. The result was an interesting mix of sweet and sour flavours, something different to experience should you require an additional dish. Other notable highlights from the menu include the Braised Crispy Sea Cucumber in Abalone Sauce (S$16.80 per person) and the Pan-fried and Braised Marble Goby (Soon Hock) (Seasonal price per 100). For desserts, we couldn’t conclude our meal without some authentic Teochew treats such as the Mashed Yam with Pumpkin (S$4.50 per portion), also commonly known as “Orh Nee”, Tau Suan with Gingko (S$4 per portion) and a rather unique Teochew snack, Crispy Pumpkin, Yam and Sweet Potato Strips (S$12). Rants Expect refined Teochew cuisine being dished out here, which is the good part. The less-than-ideal part will definitely be the price tag. Will I Return Again? Overall, this is one restaurant which serves high quality food based on what we tried. While prices leaning towards the steep end, it is unfair to compare Paradise Teochew to other casual dining concepts as it is not meant to be positioned on that segment. That said, this is a good dining option if you are in for some authentic Teochew fares with a nice ambience which will certainly impress your folks. Make your reservation instantly at Paradise Teochew Restaurant here.